The Oklahoma City Thunder, like their current opponent, haven't made it out of the first round of the NBA playoffs since 2016. On Sunday, the Thunder fell behind 1-0 in the first round. They shot poorly — 5 of 33 (.152) on 3-pointers included — and couldn't quite overcome a poor start against the Trail Blazers, who led 39-25 after one quarter and won 104-99 at Moda Center. The Thunder viewed their poor shooting as an aberration. "We got great looks all night," said OKC's Paul George, who was 8 of 24 from the field en route to 26 points. George is dealing with a nagging injury to his right shoulder. He insisted his missed shots weren't a product of that, but admitted that not shooting a basketball for the past few days had an impact. "For me, it's just rhythm," he said. "Four days ago, I couldn't lift my shoulder. Fast-forward to today, and I just couldn't get in a rhythm." Game 2, set for 7:30 p.m. Tuesday at Moda, should be different, George suggested. "Tomorrow, we get shots up and get back in tune and try to get the same looks we got tonight," he said. Plenty of Oklahoma City's misses were open shots — a point of emphasis for both the Thunder and Blazers in their analysis of the best-of-seven opener. Thunder coach Billy Donovan said his team was well-balanced offensively, and Portland coach Terry Stotts said the Blazers will need to do a better job defending the 3-point line. Stotts recognized that George's shooting was a "big difference" during the regular season. The All-Star forward put up 37, 36, 47 and 32 as the Thunder swept four games. "We gave (George) too many open 3 looks (Sunday), and that's going to be a concern going into Game 2," Stotts said. "But he's a great player — he's going to get his shot attempts." Game 2 will present an opportunity for both teams to make necessary adjustments and seize momentum in the series. Oklahoma City can steal home court with a win, and the consensus of its players and coaches is they will do that if they hit open shots. "We got downhill, we got to the front of the rim, we scored points in the paint, and we got really good open looks," Donovan said of Game 1. "We just didn't shoot the ball particularly well from behind the 3-point line." OKC guard Russell Westbrook started slowly but found his spots to attack the basket. He notched a triple-double with 24 points, 10 rebounds and 10 assists. Westbrook and the Thunder thrived in transition and were able to score 15 points on 19 Blazers turnovers. 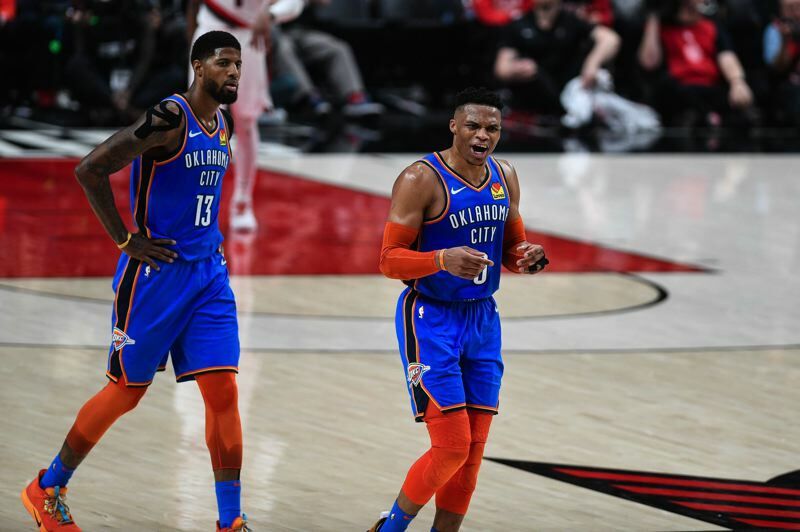 Despite the game's intensity and his team's visible displeasure with both the result and how the game was officiated, Westbrook was even-keel at the media podium. He said he was "very" encouraged despite the loss. "It's a series, the first to four," Westbrook said. "They won the first game. That's a part of the series — make adjustments, come back, play harder the next game and try to take care of business."